Both my girls enjoyed watching the Barbie movies and we a good sized collection of them. I started buying them for Olivia when she was younger and as she’s started outgrowing them Bridget has really gotten into the movies. In fact, Bridget was so excited when Barbie: A Perfect Christmas arrived late last week and wanted us to watch it right away! The movie begins with Barbie and her sisters, Skipper, Stacie and Chelsea packing to leave on trip to New York City to visit their aunt Millie for Christmas. They each have a different reason for their excitement including Skipper going to listen to a band play a song she wrote and Chelsea feeding the sea lions at the zoo. However, as they are enroute in their airplane they hit a major winter storm. The pilot announces that they are making an emergency landing in Minnesota….a long way from the destination. Of course, Barbie promised her sisters a “perfect Christmas” and was bound and determined to get them to NYC. They end up renting a car and driving to NYC in the blizzard conditions. I thought she was nuts because I hate driving in the winter and am terrified when road conditions are bad. Barbie realizes that they aren’t going to get far with the weather so bad and thankfully they see an inn and decide to stop for the night. This inn in the town of Tannenbaum (note the Christmas reference here) is no ordinary inn. Its full of people in full Christmas mode especially the inn owner Christy. Little Chelsea even shrieked in excitement when she saw elves wrapping up gifts and putting them under the huge Christmas tree in the inn foyer. Christy informed her that they weren’t elves, but the Ellef family and their pointy ears were actually a bluetooth in the shape of elf ears! Barbie again promised her sisters that they would have the perfect Christmas and would head out to the airport in the morning. Again change of plans when the planes were all cancelled and they would NOT be able to make it to NYC by Christmas. The sisters decide to go outside exploring. I thought it was a little strange that were not dressed warmly at all and didn’t even have mitts. Even Christy, the inn owner, was outside without a winter coat on. Bridget didn’t pick up on this, but I did especially since I have lived through harsh winters. Little Chelsea spots some “Reindeer” which turns out to be dogs with reindeer hats on. One little husky pup pulls her on a sleigh on a thrilling ride through the forest while her sisters chase them down. That was one of my favourite scenes because it brought back my childhood Christmas memories of snowmobiling with my dad and sisters in the forest near our home. While out in the wilderness, the sisters meet up with a band practicing and in need of a singer. Of course, this is Skipper’s dream so she has the idea for a show to perform for the inn and the local town. She begins to plan the show and is struggling but refuses to ask for help. I felt for her because she looked up to her big sister, Barbie who seems like she can “do it all”. Skipper feels like a failure because she takes on too much. In the end, everything turns out though and is a success and there’s even a nice surprise in store for the sisters. Both Bridget and I enjoyed the movie. Bridget loves the scenes where Chelsea was being pulled on the sleigh by the puppy and the music. I enjoyed how sweet this movie was and how it put me in the Christmas spirit and reminded me of my own childhood. The only thing that turned me off just a bit was the very first song. It was a bit awkward in terms of its tune, the lyrics and a few of the voices of the singers. The rest of the music in the movie was fine though. The DVD also includes bonus features including outtakes, a music video, an all-new Barbie short, a sneak peek of Mermaid Tale 2 and more. I would have bought this DVD for Bridget for Christmas if I hadn’t received a review copy. It was perfect for her and I even enjoyed watching it! If you have a little girl who is a Barbie fan, this DVD would make a great gift. 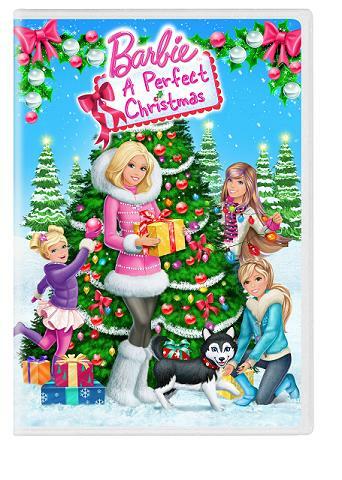 One of my readers will win Barbie: A Perfect Christmas on DVD! It would go to my 4 yr old daughter! I would give this to my daughters. They love Barbies. I’d give this to my nieces, 3 & 7 yrs old. They love Barbie! I would give it to my son, he loves barbie! I have a little cousin who would love this! I would give this to my granddaughter Addison if I win. She has just started to like Barbee. I would give this to the children at my church! If it were to get here in time it would be a Christmas present for my 6 year old daughter, either way it will be for her 🙂 She loves Barbie so much!! This DVD would be a gift for my daughter. This would be great for my youngest daughter. Thanks for the chance to win! If I won I would give this to my youngest daughter. I would give this to my youngest granddaughter, she still loves Barbies. Thanks for having the contest! This would go to my younger daughters.